Do you have thousands of photos, documents, songs etc on your hard drive? If you do, you’ll likely have duplicates all over the place. In this guide you’ll learn how to search for duplicates and delete them; thus, saving you space and keeping you organized. This guide is included as part of the Windows Guides File Organization series. Please visit the main page if you would like to learn why this guide may be useful. 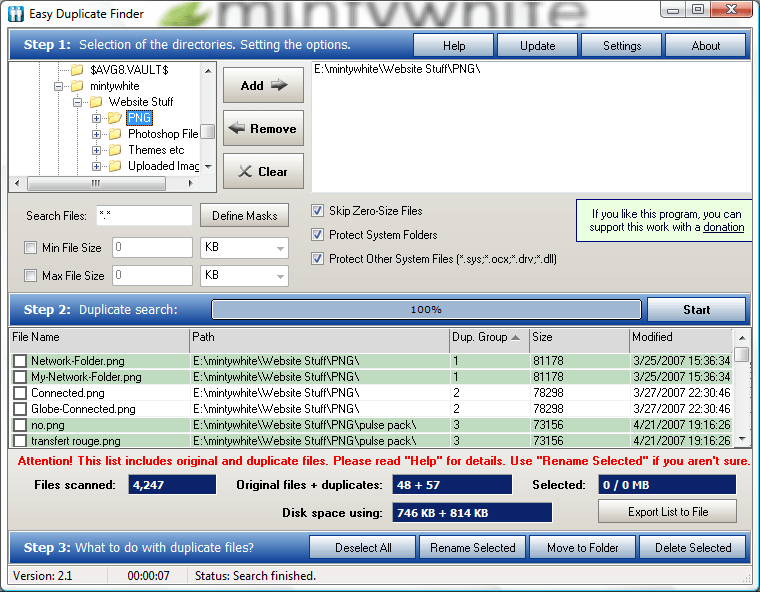 Another duplicate file finder is Clone Tools that works with both files and folders. Visit http://www.pilotman.com for more information. So far the Duplicate Finder has worked great for me! It has been a terrific assistance for me in eliminating duplicate images and songs from my hard drives – saving me loads of time. I like it! I’ve needed something like this for a long time as my backup hard drive has loads of duplicates on it. I’ve used duplicate file finders. Just make sure what areas on your computer you are searching for dups. though. I would not recommend the Windows folder, that’s for sure. You could possibly delete duplicate files that are needed to run the computer. Be sure to set the searches for EXACTLY the same file, size, name, etc. I’ve had bad experiences using dup file finders in the past. They can be a valuable tool, but use with caution.